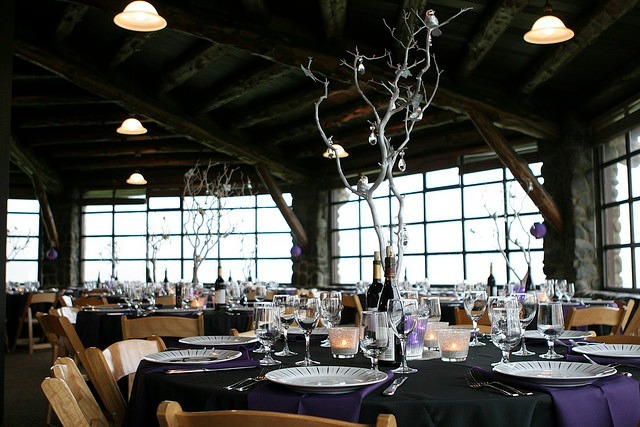 Trees, or more accurately branches, make fantastic wedding centerpieces as they have a wow factor. Plus they are cheap and easy to make yourself. 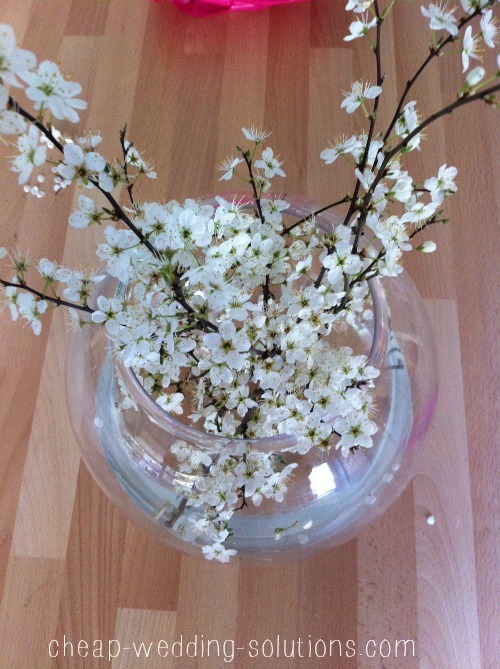 Branches shaped like trees, go for home grown, free ones, if you can. If not, you can order branches online, but before you do, think about how high you are going to need your branches to be. I think 3 feet would be the maximum, otherwise you are going to need pretty big pots to balance the weight of the branch and stop them toppling over. Also, take a look at the height of your reception room. Stones and Expanding foam to secure your branch. Terracotta pots – they are cheap and weighty. Spray paint – if you want your branches and pots painted. And an extra pair of hands! Start by spray painting all of your branches, this is easiest if you have an open space where you can lie them all down on old newspaper. When one side is dry turn them all over and spray the other side. At the same time spray paint all of your pots. When everything is dry you can start putting your tree centerpieces together. Have your extra pair of hands hold the branch where you want it to be, then place stones around the branch to hold it in place. Next is the fun and slightly dangerous part! You are going to use the expanding foam to make sure your branch never moves. Please make sure you read all of the safety instructions for the foam as this stuff can get very messy and it’s a nightmare to get off. You won’t need as much of this as you probably think – it does what it says on the tin and expands. Fill your pots with the foam and let it dry. Now you can add your decorations. 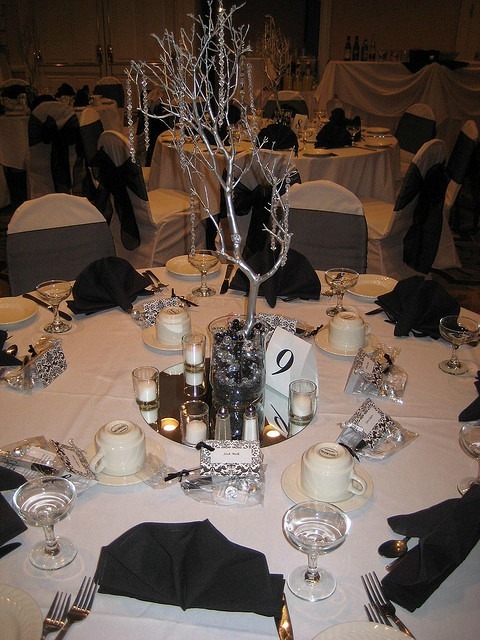 This stunning black and white tree centerpiece looks great sprayed in silver. The colored glass beads add to the overall theme and the beads hanging from the branches will give an extra sparkle when the candles are lit. Your tree branches could also be kept natural, gorgeous fall colors in the Autumn and blossom in the Spring.